I also call this "One of Everything Fudge" for soon to be obvious reasons. It also happens to be one of my very favorite flavor combinations. Halloween candy? York peppermint patties. Cake? Chocolate cake with peppermint frosting. Drink? Peppermint white hot chocolate. I had some of those minty chocolate chips leftover from the holidays that were lurking in my pantry. I have company coming over tonight and didn't want to make a big dessert so I thought, "Fudge!" No, it was not an exclamation of exasperation at the fact we are having company, I thought that fudge would be a sweet note on which to end the meal. Microwave fudge to be exact. Fridays are my housecleaning days and I usually don't spend much time in the kitchen so anything that I can pull together quickly is a huge plus. If you are a long-time reader (howdy and thank you!) you know that we only got a microwave when we moved to our current house last year. Yes, we had survived 15 years of wedded bliss without a microwave. I still don't use it for much more than popcorn but if you need fudge in a hurry, it's a great tool. 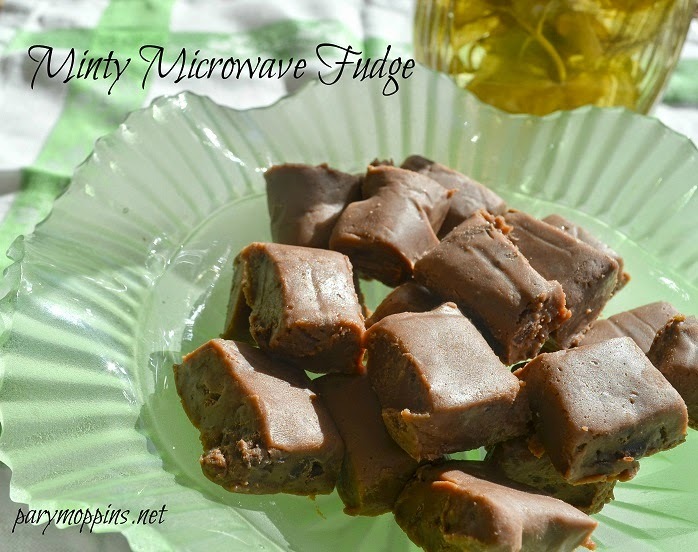 My microwave fudge is soft and pliable and creamy and delicious. You could use this as a ganache if you were so inclined. 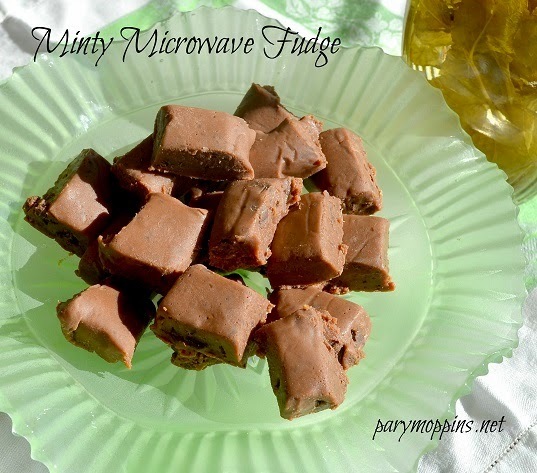 If you find yourself in a fudge emergency or needing a chocolate mint fix, this fudge is for you. Line 8 x 8 pan with wax paper. Set aside. Pour chocolate chips and milk in microwave safe bowl. Mix all other ingredients into mixture and thoroughly combine. Place in the fridge for about an hour before cutting into bite-sized pieces. *If using as a ganache, smear on cake while still warm. I never think to make fudge except on holidays. I think all this snow calls for some holiday fudge! I was so yummy that the entire pan was gone within 24 hours! I think it would be great as a ganache on a grasshopper poke cake. I would love this fudge anytime of the year! Hope you are having a great weekend and thanks so much for sharing your post with Full Plate Thursday. Me too Miz Helen! Thanks for stopping by!